Running has always been about me, my timings, my fitness, my races, etc. And every time I have gone for a race, Vasu drives me around, ensure that I get the right nutrition and struggles to keep me sane. And in the process, she has done a couple of 10Ks. So the moment she said that she was going to do the TCS 10k this year, I decided that I will run with her. We did not train with the NRC this time and so there was no lounge and the usual amenities we are used to. The day of the run, Pratheepan, Vasu and me, managed to reach the stadium by 7:30AM to join the sea of runners. For the first 10 odd minutes, we just moved with the flow, while Pratheepan moved ahead. The crowd eased up a bit after the 2km and we saw a lot of familiar faces going past. I kept cheering while telling Vasu to keep moving. It was down all the way till the U-Turn point and it was a good place to pick up some pace. She was doing her run, walk routine but we could not gain much pace. Around the 4km mark, she got severe cramps and was struggling in pain, almost in tears. I was worried but suggested that she should keep moving if possible. And onlookers started cheering us and that gave the motivation to walk. I also tried my PJs but it did not help. We walked till about the 7K mark, but tried to keep a pace of about 9mins per KM. At the 7K mark, a wheel chair participant had an emergency and I suggested Vasu to go ahead, while I went in search of a support crew / ambulance. It took about 10 minutes to get some help, and then I ran to catch up with her. She had covered a good pace and was entering Cubbon Park, by that time. We met another couple of folks who were walking at a decent pace. The next couple of KMs were covered with ease, since it was our regular route. I also realized that we would be missing the 90min mark but tried to motivate her to keep a good pace. We ran the last few hundred meters to the finish. Running a marathon is all about endurance and strong will power. For me, it was a lifetime experience. I took up serious running less than 18 months ago. Completed a 10K , thanks to Coach Beedu and Reeth of the Nike Run Club fame. Did multiple 10Ks and a 25K at the ultra last year. I wanted to do a full marathon, one of my bucket list items. The next couple of weekends, I did a 25k+ and a 30K+. That gave a little bit of confidence but I was still not very sure if I would be able to do the full in the stipulated 6.5 hours in trying conditions. Vasu and Gopal nudged me to go for the full and I thought, "Let me attempt it. If I finish, well and good, else I would know my limits". One thing was clear, I was not going to get tensed and freak myself out over it. I was just going to get through the day and take it 1Km at a time. We drove to Mysore on Sep 18th, along with a couple of friends. After dropping them at their hotel, we checked into Dasaprakash Paradise. Found out a place called Olio, serving Pasta nearby. The ambience was nice and the food was delicious but pricey. Packed a sandwich at CCD, bought some bananas and retired to bed early in a desperate attempt to get some sleep. But then, I ended up tossing and turning. Woke up next morning and landed at the run site by 6am. The run site was buzzing with activity. Met a lot of folks from Nike Run club, Hashers and RFLers. Arvind from RFL warned us that even though the sky looked clear and the water calm, it is going to be a difficult terrain and advised runners not to attempt their personal best. I caught up with Gopal and we decided to run together maintaining a decent pace. At the stroke of 6:30, what I call now, as the run of my life, was flagged off. Gopal and me started in the last group and were doing about 6 mins per KM. The first couple of KMs was nice and easy but the uneven terrain was making life difficult. I had to really concentrate on the path to avoid tripping. Around the 7KM mark, Gopal had a minor fall and he started slowing down. One of my biggest problems in running has been that, if I stop for a while, I find it hard to resume at the same pace. Found another group doing between 6-7mins per KM and joined them. Around the 10K mark, there was a really bad patch and I struggled crossing that. Met a bunch of half marathoners and ran the next few comfortably. I started tiring a bit around the 16-18K mark and was doing slow. I saw Vasu and K cheering everyone. The route was a 10.55K out and back. For the full the marathon, we had to do this loop twice. I had completed the first half around 2hrs 20 mins and started the second. Around the 23KM I was completely tired. I was not used to the sports drink and had a feeling it was just making me feel thirstier. By now, started doing a run-walk, with fellow full marathoners, and was drinking a lot of water. Got completely exhausted and started having doubts if I would be able to finish. There were 3 people whom we all saw during the run - A man running without shoes, a woman doing a half with her kid on a pram and another man running a half with a fracture, wearing a sling. If these people could do it, I better be able to do it, said my mind voice. My motto throughout the run was, If I could not run, I would walk. If I could not walk, I will crawl, but I will finish. I was mostly walking from 23rd till 28th Km. Then got a sudden bout of energy and pushed myself till 32K in 4 hours. Saw a lot of folks, tired and with cramps but with the never say die spirit. We were joking that we all have run a 10K under an hour, and we would do it today too. But easier said than done, after the 32k. Despite the scorching sun, tired legs, thirsty throat and about 6 miles between me and the finish line, the only comforting feeling was the confidence that I would be a finisher today..
Around the 38KM mark, saw Vasu. Started a walk-run back with her to the finish. Every beep on my Garmin watch was cheered since I was one step closer to the finish. I was about 500m away from the finish when someone said, "You are less than 500m from the finish and you should be sprinting now". I have no idea where I got the energy but I started running, counting every step, pushing myself till I could cross the finish line. And finally was home. A full in 6 hours and 7 minutes. This moment will be etched in my memory for ever! After the run, the limp on my feet left me in a few days, but the grin on my face remains. Last year, since I was regular at the NRC, I had trained well. However, this year, I was neither regular nor well trained. I wanted to do atleast 200K before the actual race and atleast 4-5 10Ks but I managed about 100K with not a single race distance. However, one good thing I noticed was that my overall pace had increased and I was able to do the small distances that I was running with ease. I was thinking that I would be able to do 52-54 mins for the 10k. I started of the race at an easy pace. For the first couple of KMs, I had to fight for the way. There were too many people. It eased out around the 2k mark and the next few kms were covered in quick time. I started feeling a bit tired around the 6K mark and started taking it easy. The 7th was even more difficult. When I was thinking of walking for a few minutes, I started to play with my mind. I was thinking what I would I be telling Vasu if she decides to quit. That made me push and I was able to complete that last couple of kms with relative ease. Overall I did the 10k in 56:36, a couple of minutes better than last time. Once I completed, I took a few minutes break and went back looking for Vasu. She was near the Hudson circle gate and I pushed her to run the last 700 odd metres. This was her first 10K and I am glad she completed it under 1:30:00. After the race, we went to the Nike Lounge for foot massage, photo session and a sumptuous breakfast. I also ran into Dr.Rajat at the lounge. He was cheerful and all smiles as always. When I approached him with a couple of questions, he was happy to provide me inputs on the spot. So bad that he does not consult in Bangalore anymore. The lunch was at Ragoos, on Kanakpura road, a vegetarian place for pizzas, pastas and rice. More about it later. It is a fight between your body and mind. The body says it cant go any further but the mind is trying to push. When you achieve this harmony, then you can breeze. As an aspiring runner, it is always the motivation factor that keeping me going. I always think I am mentally strong to accept and face challenges. But running is a different ballgame altogether. As in any other group activity, people draw energy from one another and motivate one another. Hence, while running at the Nike Run Club, there is no dearth of motivation. But there are times when I don’t have company. One of the biggest problems when running alone is the boredom that creeps in. I still have the energy to do another couple of KM but feel like stopping. Like last week, when I started off planning for a 15K, I had all the enthusiasm but into the second KM, I wanted to stop. The music player in my phone complained of corrupt files and stopped. I had no inclination to continue. I was figuring out ways of keeping my mind busy and the idea for this blog post was born. Another trick I do is to find someone who runs at a decent pace and try to maintain the same distance. A friend once said that, he clocks his runs by the number of songs that play in the gym. One song is normally 4 minutes, so on an average he does about 5 songs for 20 minutes. My wife has just started cycling and her biggest challenges are the uphill paths. She pants and puffs her way through them. She says, when she sees an uphill, she diverts her mind by thinking philosophy or tries to recollect lyrics of songs she learnt as a child. Sometimes, she says, she also sings aloud or smiles or waves at strangers. This diverts her mind, and she gets through easily. Unless you're not pushing yourself, you're not living to the fullest. You can't be afraid to fail, but unless you fail, you haven't pushed hard enough. Someone asked me at the NRC this morning: What is the difference between running on a treadmill and running in a community? I blurbed along the lines of this is more fun, yada yada. I might not have said what I wanted to express and hence this post. A few weeks before the Sunfeast 10K, when coach Beedu used to ask how many of us would run the 10k, a few hands would come up reluctantly. After a little prodding, a few more would raise their hands. Interestingly at the Nike lounge after the run, a lot of people were congratulating each other on their successful completion and timings. Contrast that with today. After Nike announced the registrations for the Human race on Oct 24th, the conversation has been completely different. Everyone is talking about completing the 10K, bettering their time. Today, I met a couple of folks who completed the Chennai half marathon in approx 2 hours and discussing about their experience and providing tips. Both of them started running less than six months ago. You will not find this companionship when you run on a treadmill. You will not find some one patting on your back and pace you up and ask you to push a bit and cheer you. Running on treadmill is helpful when you want to time your runs properly in a controlled environment. But it is not so much fun. Get out on the streets and you will enjoy every bit of it. If you want to run with some greenery around, go to either Cubbon park or Lalbagh. Cubbon park is the best thing that could have happened to runners in Bangalore. "There are clubs you can't belong to, neighborhoods you can't live in, schools you can't get into, but the roads are always open." A couple of years back, my only running was from my apartment to the main road where the office cab stops. Hardly about 250 metres. I will huff and puff to reach there in 3-4 minutes. Slowly, I started running at the gym. I was able to run with great difficulty, a KM under 10 minutes. The Fitness One guys started pushing me and I did a mile under 10 minutes once. I slowly started increasing the time I could run continuously and after a while I was able to run around 30-40 minutes continuously. My best on the treadmill was 5K in 32 minutes. But then, running on the treadmill was no fun. Late last year I started venturing out into the real world. It was a completely different experience. I was back to square one. I could hardly run a couple of kilometres. Then subbuj joined me as my running buddy. We started slowly pushing our limits. Subbu has a Nokia N95 with Sports Tracker installed and that helped us track our progress. I was planning for training with Runner's High, but then a sudden trip sent me to San Francisco. Thankfully, it also helped me continue my running and I enjoyed every bit of my stay there. I also picked up a good running shoe there. Once I came back, we started running at the Cubbon Park. One fine day, we decided to check out the Nike Run Club. They were just beginning to ramp up their training sessions and it was a blessing. Coach Beedu and Reeth were helpful with tips and helped in the training. Nike took really good care of us during the training sessions. They did a gait analysis, arranged pep talks, provided trial shoes and finally ensured that everyone gets mentally and physically ready for the run. The day before the event was just like the day before an exam. I was a bit nervous and was also tired. It took me a while to realise that the main reason why I started running was to have fun and if I get tensed I would miss the fun. So the next day, I went to the run with only thing in mind. Finish it and if I can finish in 90 minutes I would be happy. 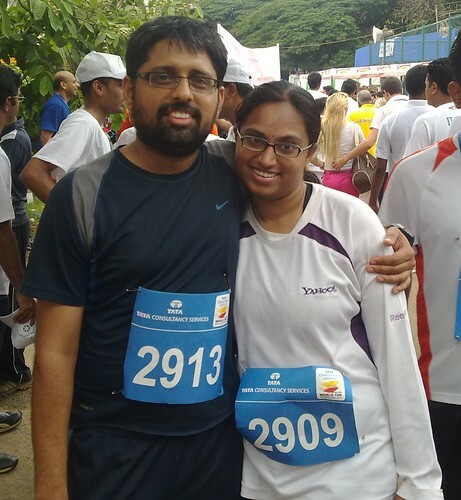 Subbu and I started running on the race day and after a couple of KM, I felt that I could run faster. I slowly picked up the pace and got into a nice rhythm. Went to the 5K mark in 28 minutes and I was nicely pulling along. Then came the difficult part of the run, since the road was slightly steep from Dickenson Road to Kamaraj Road to Cubbon Road. I slowed down and after a few minutes started walking. I walked for a couple of minutes and then started running again. After entering into the Cubbon Park, it was the regular trail and I picked up pace. The last KM was the fastest pace and according to my watch, I finished in 58:28 minutes. Woohoo! We then went into the Nike Lounge and were royally pampered. There was one guy handing out cold towels, another guy taking pictures, a sumptuous breakfast, a foot message and some very nice music. It turned out much better than what I had imagined. When the official timings came out the next day, I found that I had done it in 57:43 mins. Nike has also promised that they would give a specially designed T-shirt, "I'm a finisher" for everyone registered with NRC. So what are you thinking. If you want to start running, drop in tomorrow, 13th June, at Kanteerava Stadium at 6AM and join the Nike run club. Pain is temporary, Pride is permanent. I was getting ready to leave for my morning jog yesterday when I read this shocking news. The third page of The Hindu routinely carries such information. The reason why it worried me was that every day when I run, I see a whole lot of people walking / jogging / running on the road. Many of these folks are more interested in carrying a conversation on the road rather than concentrate on the road. Many times I see folks completely blocking the road or walking in parallel oblivious of the surroundings. If there is a park in your area, please walk there. Always walk / jog on the extreme right of the road facing traffic. If this is a new road that you are running, first for the first couple of days focus on the road and traffic to get an idea. If the foot path is usable, please use it. It is okay to lose a 30 seconds waiting for the car to pass, rather than risk your life. And if you are driver, please respect the traffic rules. If a road is marked one way, _it_ _is_ _a_ _one_ _way_. This does not (atleast in Bangalore) change based on time of the day. If you are interested in racing, go to a racing track and not the road. Give space to pedestrians. This page is a archive of recent entries in the Running category. Random is the previous category. Copyright © Balaji Narayanan. The views expressed on this site are mine alone and do not necessarily reflect the views of my present or past employers.